Enjoy the great experience cycling along well-developed cycle paths with great level stages on the Ijsselmeer Lake! The region around the Ijsselmeer Lake is rich in culture and history and offers excellent possibilities during your cycling holiday in Holland. You will discover the Netherland’s typical Zuidersee cities, including Voledam, Enkhuizen, Workum, Hindeloopen, Blokzijl, Kampen, and Harderwijk. During the tour, you will stay at four-star and three-star hotels and inns including Westcord Art Hotel Amsterdam on the first and the last night, Die Port Van Cleve hotel on the second night, De Harmonie hotel on the third night, and Hotel Cafe Restaurant Monopole on the fourth night. You will have your arrival in Amsterdam for your cycle holiday in Holland. You will start with a stroll through the beautiful city with its Grachten, bridges, and more than 800,000 bicycles. Today, you will cycle via the dikes to the former fishing village of Volendam which has kept its authentic atmosphere and is a magnet for foreign tourists. You will then continue up the coast to Edam, Hoorn, and then Enkhuizen. Beautiful buildings are reminders of the prosperous 17th century Golden Age when they were affluent harbor towns, focused on trade and shipbuilding. You will cycle from Enkhuizen crossing the IJsselmeer Lake with a ferry (approximately 1.5 hours) to the southwest of the Frisian province, to the lovely town of Stavoren. You will cycle further through the wooded hilly countryside of Gaasterland. You will pass Lemmer before you reach the national park De Weerribben, a unique peatland area with an exceptional wealth of characteristic flora and fauna. You will then reach Giethoorn via Blokzijl. You may have a boat trip with the so-called “punter” through this beautiful romantic town. You will follow the cycle path in Frisian to the national park in Zwartsluis. The lively small town is situated on a junction of several waterways and it is recommendable to cross over by boat to the other side. 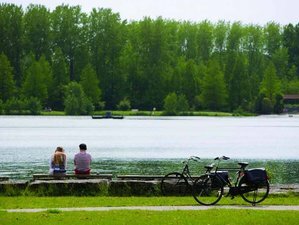 The cycle tour on the Kampen lake offers a picturesque view onto the Frisian countryside until you reach Harderwijk, today's overnight stay during your cycling holiday in Holland. You will enjoy today's cycle tour through the landscape of the Arkemheen-Eemland National Park, one of the Netherland's most beautiful regions. You will follow the shores of Randmeren lakes to Bunschoten-Spankenburg where the traditional costume and fishing museum await you. The bike tour ends in Amsterdam. Example of the hotel: Westcord Art Hotel Amsterdam. You will have your individual departure or you can stay and take some extra nights. This bike tour starts and ends in Amsterdam, Netherlands. It will cover several places including Amsterdam, Enkhuizen, Giethoorn, and Harderwijk. During the tour, you will be served daily buffet breakfast. Half board meals are also available for 137.5 EUR per person and stay.